Continuing on, we now have a song. Abigail Miller, singing Lord, I Must Be Yours! The Apostle Paul writing in Philippians 2:3-4 "Do nothing out of selfish ambition or vain conceit, but in humility consider others better than yourselves. Each of you should look not only to your own interests, but also to the interests of others." The Apostle Peter writing in 1 Peter 5:5-6 "All of you, clothe yourselves with humility toward one another, because, "God opposes the proud but gives grace to the humble." Humble yourselves, therefore, under God's mighty hand, that he may lift you up in due time." Those verses probably highlight what those who call themselves the Lord's people are to be and do! Humility! Looking to others first! Contrast those values to those of the twenty first century society. A society where the prevalent attitude is: "There are no other people. The order is 'me, me and more me! I am far more important and higher than anyone else!'" This is individualism, an individualism where the individual's importance is placed higher than all others! Individualism, which is imbued with self-reliance and personal independence. Even when help and compassion are offered, so often there are strings attached and hoops to be jumped through: "If you do this, we will do this for you." That's the view in 21st century Western countries such as the USA, UK and Australia. Sadly, it is not just within society that this exists, but also within the church and amongst Christians. How opposite is that view, compared to the view of Peter and Paul in the Bible reading! It is as if we are denying the basic rule of compassion and mercy, which dictates that we, as Christians, are to be serving others, because they are also humans created in the image of God, loved by God and so should be loved unconditionally by those who proclaim to be God's people - the Church. Denying that basic need to others is pure unadulterated selfishness and places others below our own selves. Individualism within the church, lends itself to hypocritical behaviour and attitudes, which are inconsistent with Scripture and behaviour. Individualism, where you as an individual are placed at the front of the queue, is not loving others and not considering others higher than yourself. It certainly could not be construed as serving other people to always place your own desires above all others. There is an old acronym JOY - Jesus first, Others second, Yourself last. So as we live our lives, let us be determined to be counter-cultural, love and serve others, being willing to listen to them and giving them practical support when we can. Now a time, where I put before you a couple of questions for you to ponder and think about, before we continue in prayer. Perhaps you could write them down for later. Q1. In what areas of my life do I usually put myself before other people and sin against them? Q2. What impact could I make on my church and local community if I was more willing to serve and practically love others, rather than be served and supported by them? ready from head to toe. Wake up, you sleepyhead sun!" singing your praises in town and country. every cloud's a flag to your faithfulness. Soar high in the skies, O God! Cover the whole earth with your glory! reach down and help me-answer me! I hand out Succoth Valley as a gift. to say nothing of Manasseh. rain fireworks all over Philistia." 10-11 Who will take me to the thick of the fight? Who'll show me the road to Edom? You aren't giving up on us, are you, God? refusing to go out with our troops? he'll flatten the opposition for good. You can now purchase our books! Please do click here to visit our Amazon site! A devotional life is important for Christians. A time each day spent learning more about God and developing their relationship with Him. Most of the ways for the doing that are word-based. However an increasing number of people learn and engage more easily with the use of images. This is where this book can help you if that is you. 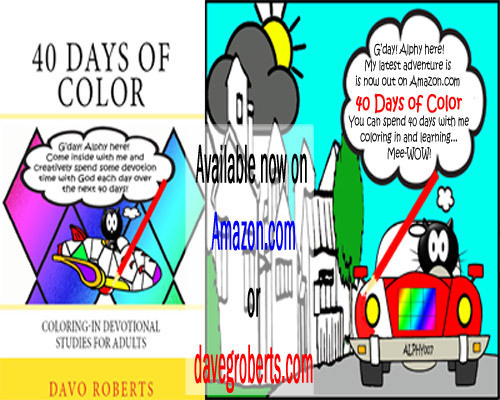 Coloring-in for adults is a fun, relaxing way to engage your innate creativity with your devotional life. Whether just starting a daily devotional life or you want a different way to refresh your daily time with God. Consider it Messy Church for your devotions! Come inside with Alphy the WOWChurch Cat to see how these daily coloring-in devotionals can stimulate your imagination and develop your relationship with God! It is great for adults but also fabulous for family devotions, spending quality time having fun in this simple way while thinking about God. Over the 40 Days of Color, we cover Jesus' I AM statements, the Lord's Prayer, the Spiritual Armor and the Fruit of the Spirit. You can now purchase our books! Please do click or tap here to visit our Amazon site! And now, as we close, may the God of hope fill you with all joy and peace in believing, that you may abound in hope by the power of the Holy Spirit. 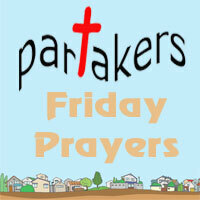 Thank you for joining us on Partakers Friday Prayers. If you would like to post a prayer request in the comments below, either named or anonymous, we will pray for you. 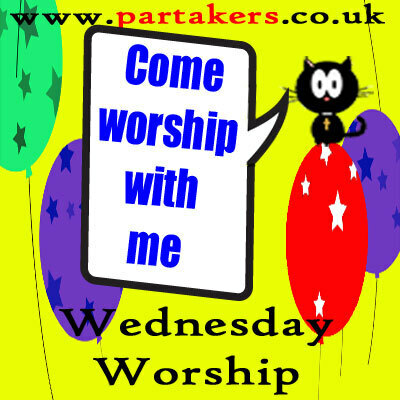 G'day and welcome to Partakers Wednesday Worship on the 22th of July, 2015. O Almighty God, great and wonderful are you! We praise you God the Father that you cares for us! 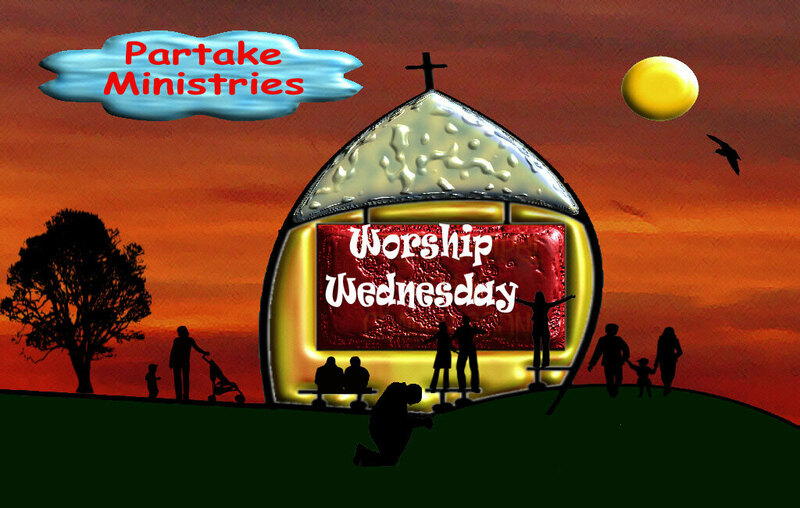 We praise you God the Son, Jesus Christ, that you are our saviour and mediator! that you live inside us as a deposit and seal of our salvation! We praise you Father, Son and Holy Spirit that You are the very givers of life! Our LORD, let your worshippers rejoice and be glad. and you come to my rescue. Please hurry and help." Luke 6:38 - "Give away your life; you'll find life given back, but not merely given back-given back with bonus and blessing. Giving, not getting, is the way. Generosity begets generosity." Luke 12:33-34 - "Be generous. Give to the poor. Get yourselves a bank that can't go bankrupt, a bank in heaven far from bankrobbers, safe from embezzlers, a bank you can bank on. It's obvious, isn't it? The place where your treasure is, is the place you will most want to be, and end up being. How is your vision of Jesus Christ? I wonder how your vision of Jesus Christ is? Practically everybody is comfortable with Jesus as a baby. Almost everybody is comfortable with Jesus as a great moral teacher. Just as they are with the Jesus hanging on a cross as the death of a tragic want-to-be hero. Most Christians are comfortable with the Jesus who rose from the dead to new life and then ascended back to the right hand of God the Father. Most Christians are comfortable with the hope that Jesus will come again and that they will be with Him forever. But if that's your vision of Jesus Christ, the most outstanding man in all of history, then I would suggest that your vision of Jesus is too small, too pre-packaged and preconceived! Let me ask a few questions and see how you respond to them! Are you comfortable with the Jesus that also demands you die to self and live to, and for, Him alone? Are you comfortable with the Jesus who demands that the poor, oppressed and the lonely are taken care of by you? Are you comfortable with the Jesus who is going to call you to account for every word you have spoken or thought and not spoken when you had the opportunity? Are you comfortable with the Jesus who is going to call you to account for every opportunity you have taken in His name or missed taking in His name? Are you comfortable with the Jesus who calls you to serve Him alone and commands that you serve others as part of your service of Him? Are you comfortable with the Jesus who calls you to give, keep giving and trust in Him to supply your needs? How did you get on? How is your commitment to Jesus Christ? When Jesus Christ called you to follow Him, He called you to follow Him wholeheartedly and committed to only Him. How is your vision of Jesus Christ now? Jesus Christ calls people to be totally committed to himself. Perhaps the greatest indicator of your commitment to Jesus Christ is in your giving? How is your giving? Jesus talked about giving quite a lot, as indicated by our readings in Luke 6 and 12. God gave everything so that you may have life and life in abundance. Not for its own sake, but for the sake of Jesus Christ. So by giving generously, you are reflecting that God has given abundantly to you. And a further suggestion is that you don't make a big show of your giving but do it quietly and secretly if you can, so that all the glory goes to God and Him alone. Giving generously is not just financial. It could be an email, a smile, a touch, a kind word or a phone call. These things too are valuable to the recipient, particularly the lonely and oppressed. Go and give what you can. We are to give generously, but not just to those we like. Just as we are not to love only those we like and get on with. We are commanded to love everybody, particularly our enemies, and give to those in need. Imagine the impact for the spread of Jesus Christ, if Christians and churches gave like that in their communities! Many people speak that prayer we read from the Old Testament - Psalm 40-v17 - crying out to God for help. It may well be, that you can be God's arms and legs for that person, crying it out to God in prayer. Ask God to expand your imagination to give and then be prepared to follow it and give to others. May your vision of Jesus Christ be enhanced through your imaginative giving! Lord, in your mercy, expand our imagination to give to all others generously what we can, to be your arms and legs and to be the answer to the cries of somebody else. Amen. and despised the counsel of the Most High. and his wonderful deeds for men. they were at their wits' end. and consider the great love of the LORD. "Out of your comfort zone"
Hi there. Did you have a good Sunday in Church? "Wow.. yes" you say "the message really hit home and although made conscious of my failings I had the reassurance of forgiveness but also the challenge to aim higher in my Christian life today and throughout this week. I really do want to count for Jesus. I was already conscious of my needs before yesterday but God spoke clear and plain and now I want to answer in the best way I can as I serve Him today. He has done so much for me and I really want to honour Him as Lord in my life. However I realise afresh and know that I need to keep in touch with His power and wisdom in all I do. Doing things God's way is all important to me." You sound like a mature Christian and now God is doing a new thing in your life as you take your Christian life more seriously ?. Perhaps you are launching out on something you have never done before. A new venture? May be this is new to you but countless others have passed this way before and in launching out upon this new trail you will need to share your vision and request others to help you realise your goals. Ask them to pray with you as well as advise you You may need to swallow your pride and listen to others. Elisha listened very carefully to Elijah before he departed from him (2 Kings 2:9;) and in providing the cloak he owned, Elijah was passing on more than a mantle to keep Elisha warm but in so doing was saying through his action, "The same God I have served faithfully and obediently has equal power and even a double portion to give to you Elisha as you step out onto His chosen path for you." Yes, we have others to teach us and learn from, and the same Holy Spirit to guide and guard us today. It is true we enjoy our comfort zone but there are times when we are required by God to step out and trust Him in new experiences and see His powerful hand at work in and through us. Yes, very scary at times but what does the Lord promise us as we push out from the shore in faith? Proverbs 3:5-6 reads "Trust in the Lord with all your heart and lean not to your own understanding. In all your ways acknowledge Him and he will direct your paths". May I encourage you to read and reread His promises to you. Watch in other places in scripture for His will to be confirmed to you. Little by little He will make it clearer to you as you rely upon Him. Meanwhile ask questions of others who have travelled this same or a similar path way that you are taking and you will see a pattern developing as you obey Him. When Israel came to the Red sea they certainly hadn't been that way previously. A dead end? A fruitless journey? Impossible situation? What did Moses do with a million voices demanding an answer. He prayed and the Lord showed him the truth contained in Proverbs 3:5-6. Moses commanded Israel as they came to the Red Sea"Stand still and see the salvation of the Lord" (Exodus 14:13) The result? A miracle took place and the incredible took place because we have an amazing God. The waters acted for them and not against them in an unnatural way forming walls for them to pass between. Obedience and faith exercised always bring good results. Trust Him He will never disappoint you. You can now purchase our Partakers books! From his death-bed. Repeats the same exhortation to knowledge that we may love. GOD knows best what is needful for us, and all that He does is for our good. If we knew how much He loves us, we should be always ready to receive equally and with indifference from His hand the sweet and the bitter; all would please that came from Him. The sorest afflictions never appear intolerable, but when we see them in the wrong light. When we see them in the hand of GOD, who dispenses them: when we know that it is our loving FATHER, who abases and distresses us: our sufferings will lose their bitterness, and become even matter of consolation. Let all our employment be to know GOD: the more one knows Him, the more one desires to know Him. And as knowledge is commonly the measure of love, the deeper and more extensive our knowledge shall be, the greater will be our love: and if our love of GOD were great we should love Him equally in pains and pleasures. Let us not amuse ourselves to seek or to love GOD for any sensible favors (however elevated) which He has or may do us. Such favors, though never so great, cannot bring us so near to GOD as faith does in one simple act. Let us seek Him often by faith: He is within us; seek Him not elsewhere. Are we not rude and deserve blame, if we leave Him alone, to busy ourselves about trifles, which do not please Him and perhaps offend Him? 'Tis to be feared these trifles will one day cost us dearly. Let us begin to be devoted to Him in good earnest. Let us cast everything besides out of our hearts; He would possess them alone. Beg this favor of Him. If we do what we can on our parts, we shall soon see that change wrought in us which we aspire after. I cannot thank Him sufficiently for the relaxation He has vouchsafed you. I hope from His mercy the favor to see Him within a few days. Let us pray for one another. 32:1 Blessed is he whose disobedience is forgiven, whose sin is covered. in whose spirit there is no deceit. 32:4 For day and night your hand was heavy on me. My strength was sapped in the heat of summer. 32:5 I acknowledged my sin to you. I didn't hide my iniquity. I said, I will confess my transgressions to Yahweh, and you forgave the iniquity of my sin. in a time when you may be found. they shall not reach to him. 32:7 You are my hiding place. You will preserve me from trouble. You will surround me with songs of deliverance. 32:8 I will instruct you and teach you in the way which you shall go. I will counsel you with my eye on you. who are controlled by bit and bridle, or else they will not come near to you. but God's loving kindness shall surrounds the man who trusts in Him. 2:11 Be glad in Yahweh, and rejoice, you righteous! Shout for joy, all you who are upright in heart! Isn’t it great to be a believer? Or maybe yesterday’s meetings at Church were not much of an inspiration to you as you begin a new week? You just didn't get much from the services yesterday. You listened but other thought you allowed to crowd in. Concerns for certain family members, friends or neighbours. So you have not started the week with gusto. Even your morning quiet time today didn’t go well. Your prayer life hit rock bottom. Your prayers, you thought didn’t get any higher than the ceiling. You had to not only drag yourself out of bed but also through your devotions. "Is this what the Christian life is all about?" you ask yourself. Am I not meant to be a joyful triumphant Christian? Our minds are fertile ground and must be guarded and guided. They are open to all kinds of infiltrations and our part is to guard our minds and put useful good healthy thoughts in. The key is to ask ourselves the question "What would Jesus have me do?" "What can I do for His Kingdom and name sake?" "Is there someone today I could meet up with and encourage? Someone to offer financial help to? Someone who needs my sympathy? Someone who needs a car lift to hospital? We need to take our minds off of our own needs and focus on others and their needs. Minds can soak up all kinds of useless stuff if we let them. Jesus took time to prepare himself for each day. He began with several hours in prayer. Maybe we should see Him as our example as well as reading a good Christian biography, including a commentary on a passage from the Bible each morning and pray it in. If we did we might have a much better day. It’s our relationship with Jesus that will determine our state of mind throughout the day. Think on these things .Have a great day and a great week! Dear Lord, take care of my mind and do not allow those awful thoughts to continue in my mind. 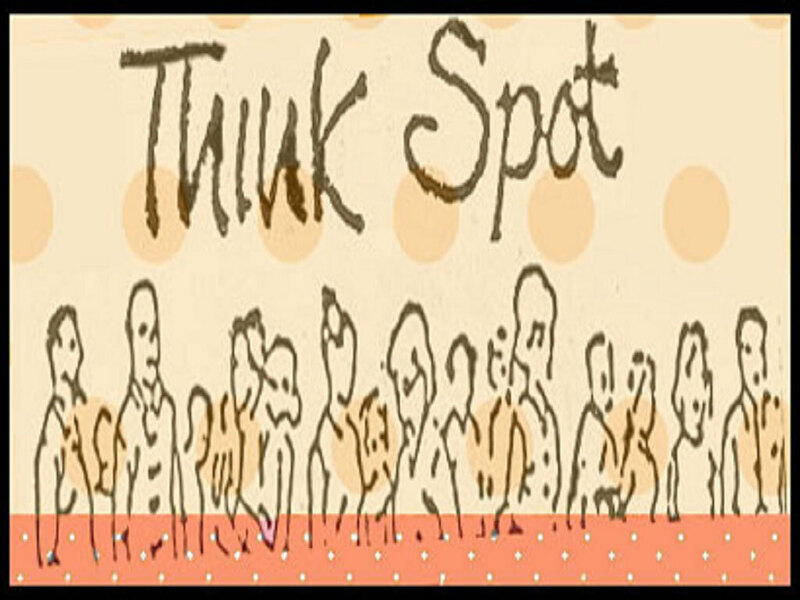 Help me think upon good useful thoughts that are sweet and helpful to building others up which will glorify God. I am sorry for allowing such rubbish to fill my mind. Instead, fill my mind with thoughts such as "How would Jesus think about this situation where I have anger, jealousy or even hatred. The truth is I want to be like You Lord." In Jesus name.